Happy Holidays from Closet Canuck! I'm already looking forward to 2009. Oh, there are some concerns. The Washington State Ferries, in all their "wisdom," are once again threatening to cancel the ferry service between Anacortes, WA and Sidney, BC. This is a marine highway, Washington, so save some $$ elsewhere! And of course the economy is affecting all of us on either side of the 49th Parallel. But with the excitement surrounding the upcoming Vancouver 2010 Winter Olympics (I'm going to the Sarah McLachlan concert in Vancouver on Feb. 12, 2009 that kicks off the "one year to go" mark) and the big change in U.S. politics, things are not as gloom and doom as we're led to believe. Now I just have to figure out how Canadian politics works! 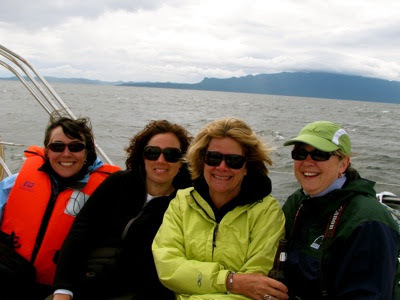 That's me in the bright green jacket (and the Kokanee! ), third from the left, with three fellow travel journalists from Canada. We're enjoying sailing off Rockwater Secret Cove Resort.